Computer keyboards work most of the time just as they should. You tap on a key and it is printed or interpreted by the computer the keyboard is connected to. Sometimes though, you may recognize that key presses are not detected by the computer, or that keys are pressed multiple times, or that key combinations don't work properly. Switch Hitter is a free program for Windows that helps you diagnose keyboard related issues. It has been created for mechanical keyboards in particular but works with any computer and keyboard combination. Issues like keyboard ghosting, chatter or actuation can be analyzed with the tool. Ghosting for instance refers to situations where multiple simultaneous key presses are not recognized and the keys that are not recognized are referred to as ghosted. Chatter or bouncing on the other hand refers to issues in mechanical keyboards were a key press is detected as multiple presses. Switch Hitter can detect these issues. When you start it up after installation you are presented with a keyboard layout and information at the top. First thing you do is check whether the layout matches the keyboard you are using. Since Switch Hitter displays a 104 Key Ansi keyboard layout by default, it may not be the case. You use the menu at the top right to switch between different layouts. Please note that only four ship with the program currently (104 Key ANSI, 105 Key ISO, 87 Key ANSI, 88 Key ISO), and that two additional layouts for German and French keyboards are offered as downloads on the official website. Keyboard layouts are saved as .kbl files by the program in the layouts directory. You may add keyboard layout files of your own using plain text editors and information on creating custom layouts are provided on the official website. The program detects language codes but won't display language specific keyboard layouts by default. For instance, it displayed a US-American keyboard layout on my system even though it detected German as the language. This meant that it would not display the German Umlauts ä,ö and ü or switch Y and Z on the keyboard. While that was the case, it did detect the keys properly (but did not identify them properly) so that it can still be used to diagnose issues. After I downloaded the German keyboard layout and switched to it in the program, it would display the layout properly. The actual testing comes down to hitting individual keys or combinations of keys on the computer to check the output in Switch Hitter afterwards to determine if everything is alright or if errors occured. If you press a key but it is not highlighted by Switch Hitter, you know immediately that something's wrong with it. The program uses colors to highlight responses. Green for instance indicates keys that have been pressed while red that something is wrong. While the program won't necessarily reveal what is wrong, it helps you detect faulty keys or keyboard ghosting/bouncing issues. 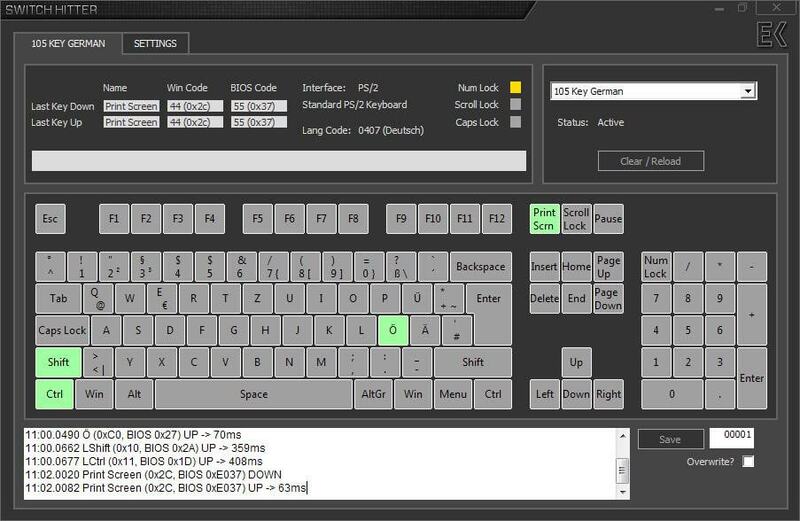 Switch Hitter is a useful software to diagnose keyboard issues, especially those where key presses are seemingly not accepted by the computer. Good question. I’m not familiar enough with Linux to answer that question, but a quick search for “linux keyboard testing” revealed several interesting tools and articles on the topic. Interesting, but it does not seem to work for Norwegian keyboard. Anyone tryied this for other languages than American, German or French? I have not. If it is not working, you probably need to create your own keyboard layout for it first to make it work.